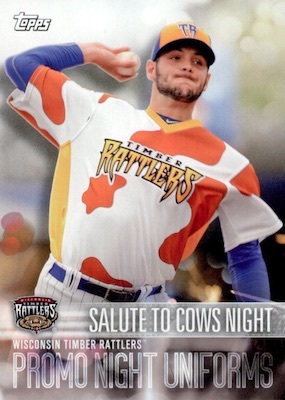 In need of your MiLB fix? 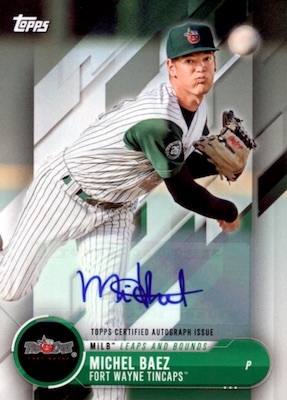 2018 Topps Pro Debut Baseball delivers stars and new arrivals from across the minor league ranks. Maintaining the hobby-only format of 2017, the 2018 set also continues the box output of two autographs and two relics. 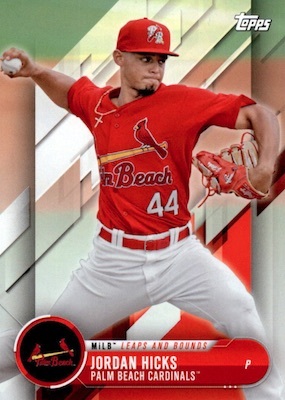 Applying the 2018 flagship design to minor league players, including the very first cards for players from the 2017 MLB Draft in their MiLB uniforms, 2018 Topps Pro Debut Baseball works with a 200-card base set and several limited parallels. 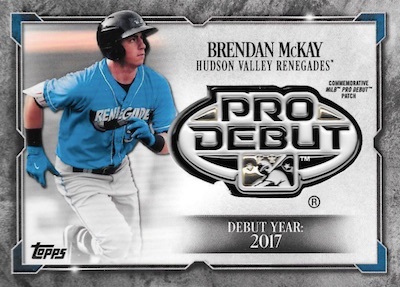 New inserts in the 2018 Topps Pro Debut Baseball checklist include MiLB Leaps and Bounds for those promising young stars. 2018 also sees the continuation of the Ben's Biz and Promo Night Uniforms sets. These have a selection of parallels, as well. Among the signed choices that combine to fall two per box, the Base Autograph line naturally works with the primary design. There are also numbered parallels like Green, Red (#/10) and FoilFractor (1/1). 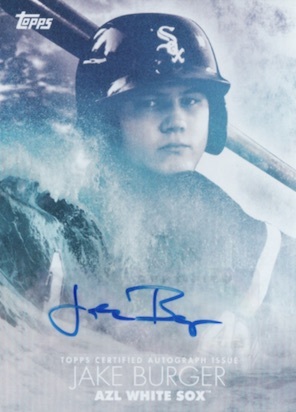 Utilizing a distinct look, case-hit Splash of the Future Autograph cards are limited to 99 or less. 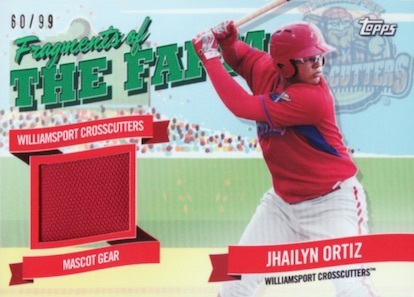 In addition, collectors can keep an eye out for MiLB Leaps and Bounds Autographs. Relics also average two per box, and 2018 Topps Pro Debut Baseball contains a few different options. Promo Night Uniform relics contain jumbo pieces from the jerseys in question, while Fragments of the Farm opts for more unique memorabilia pieces associated with the team. Distinguished Debut Patch cards are a new manufactured relic. 200 cards. Pro Debut (PD) players noted. Shop complete base sets on eBay. PARALLEL CARDS: Green #/99, Orange #/25, Red #/10, Black 1/1. 15 cards. 1:100 packs. Full guide and gallery. 65 cards. 1:18 packs. Shop Pro Debut autographs on eBay. PARALLEL CARDS: Green #/99, Orange #/25, Red #/10, FoilFractor 1/1. PARALLEL CARDS: Orange #/25, Black 1/1. 30 cards. Serial numbered #/99. 1:101 packs. PARALLEL CARDS: Gold #/50, Red #/10, Black 1/1. PARALLEL CARDS: Green #/99, Gold #/50, Red #/10, Black 1/1. PARALLEL CARDS: Green #/99, Orange #/25, Black 1/1. 15 cards. Serial numbered #/50. 1:415 packs. View the 2018 Topps Pro Debut Baseball checklist spreadsheet. Good: Fair box price; several top prospect signers; fun feel. Bad: Recycled flagship design; sticker autographs; weak manufactured relics. 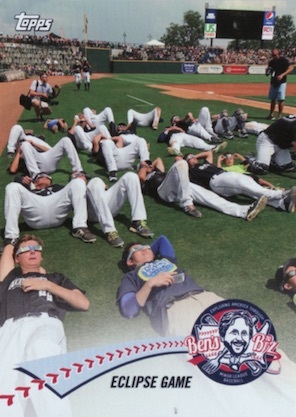 The Bottom Line: This is a solid MiLB set that does a good job capturing the minor league experience in cardboard form. 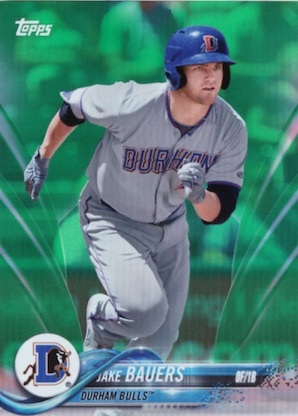 Of course, value and demand will always be limited in comparison to the main prospect or MLB sets, but still worth a look if you want something different that features young baseball stars. One of several sets to borrow the flagship design, I do get a little bummed out seeing that again instead of an original design. This is also the case for the main autograph set. Fortunately, the inserts and other hits opt for something else. It is not remarkable but perhaps Leaps and Bounds should have been used for the base design. 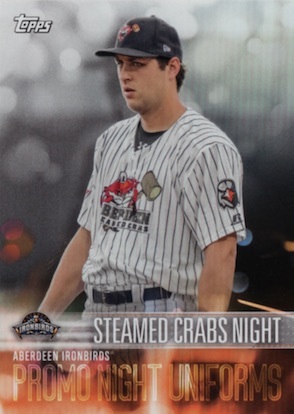 I like the Promo Night Uniforms cards more for the funky gear worn in the images than the oversized text at the bottom that comprises most of the design. And Ben's Biz does a great job capturing the atmosphere at individual ballparks. Several of these provide some cool images, as well. While they don't fit into the set from a design perspective, the signed Splash of the Future inserts really stand out. It does seem more like something from Topps Fire. I like them as a nice contrast but these rare hits should really be on-card autographs. 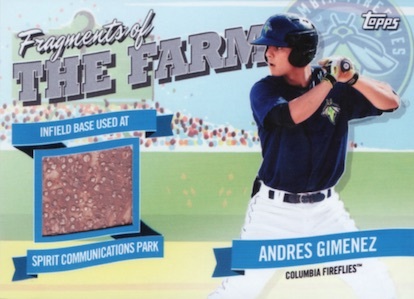 And the Fragments of the Farm cards continue to be some of the most intriguing relics out there. Still, there are some very questionable selections this year. 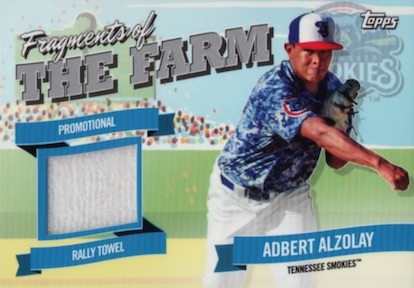 Promotional rally towel relic? Come on! Plus, I'm not sure how they can really be attached to a specific player. To be honest, the Distinguished Debut manufactured patch set is disappointing. 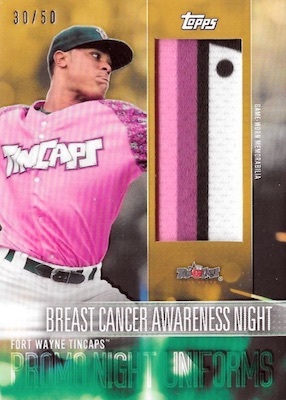 Topps already has an issue with putting these out too often and to use the actual Pro Debut logo as the patch is quite lame. 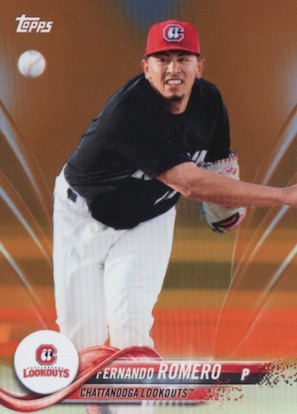 With no short prints other than the tough image variations and the Make Your Pro Debut winner card, the 2018 Topps Pro Debut Baseball checklist is very attainable for set collectors. Led by signatures for Ronald Acuña Jr, Gleyber Torres and Hunter Greene, the autograph lineup is also pretty strong. There is even some extra fun in the base set, including Erik the Peanut Guy and Toastman. Plus, where else can you get a card for Derby, the bat-retrieving dog for the Trenton Thunder? His legacy lives on in the 2018 product. So, you get two autographs and two relics in a box that runs about $65-75 (at the time of this review). That's pretty good. Bonus hits are not uncommon and our review box had an extra memorabilia card. This is also a boost for value. On the other hand, as is the norm for MiLB sets, the cards inside, even for the biggest names, take a backseat to true prospect sets and the normal MLB releases. This holds the value back a tad. This is a very fun set. To me, it just needs its own base design and a switch to on-card signatures, and it becomes a fantastic set. Although the review box contained an extra hit, it was the third Fragments of the Farm card in the box. Hard to complain about a bonus hit but it would have been nice to get something from a different relic set. While I will buy a pack of 2018 topps to see if I like the design better which will decide if I buy packs of this set I can say I am looking forward to the following insert sets. Derby!!!! I miss that dog. They need to make one of Rookie now. Pulled an auto #25 but not listed above? Any ideas. Probably not the biggest hits you can find, but man is it fun. What other set has the Belly Buster??? Great product. My hobby box contained 2 autos and 3 relics. Unusual? Great Design – continued on this set. 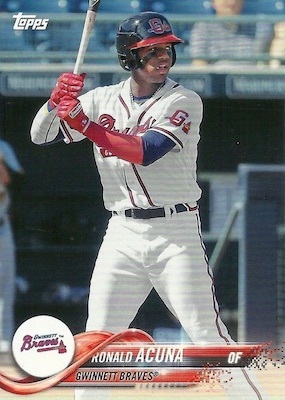 Was able to get an Acuna which was not short printed. Awesome set. Took two boxes to complete a base set. Great value! Autos and inserts are great. 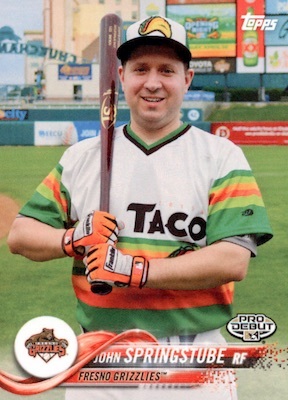 Can’t wait for Heritage Minors, just hope Topps doesn’t use the same images that they used in this set. Still 18 cards short of a base set with 2 hobby boxes. Probably no guarantees of filling the base set with a third box either. Nonetheless, it is a great product. 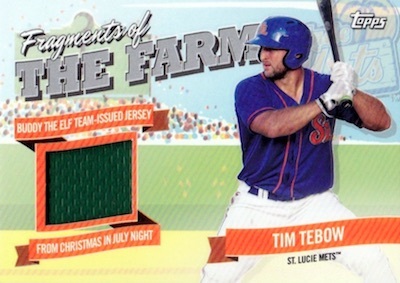 The Fragments of the Farm relic cards are terrific. 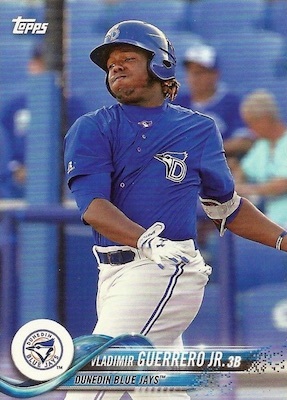 And Derby would have to be one of the best base cards anywhere.